Believe it or not - Megrew's Boats has a store! 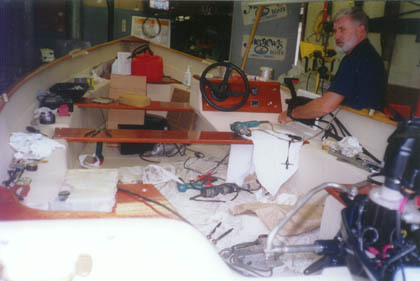 We have an extensive supply store for power, sail and kayak recreational and fishing accessories . Located at the intersection of Route 1 and Route 216 (Ross Hill Road). (See the map to see where we are.) Our store is open for business Monday thru Friday 9 AM to 5:30 PM and Saturday 9 AM thru 5 PM. Please stop by when you need supplies - if it has to do with power, sail or kayaks, chances are we have it. 2. Are you on the water? We are not on the water but conveniently accessible within one mile of salt and fresh water ponds and rivers . See the map to get a sense of where we are located. 3. Do you sell and service motors? Yes! Tohatsu, Nissan, Johnson, Evinrude, Cobra, and OMC Sterndrives. 4. Do you sell bait? 5. Do you rent boats or equipment? No we do not rent boats or equipment. 6. Do you ship parts and accessories?